Our family have always had dogs in our house. With my husband Richard, who is retired, we run Franki's Friends Bespoke Dog Boarding and Day Care in Westergate nr Chichester in the wonderful West Sussex. Franki is a lively Springador who we have had from a pup ( June 2016). We ensure all the dogs we look after are treated like one of our family. I am Trained in Canine First Aid. Richard and 1 are both DBS checked, Licenced by Arun District Council and have a Certificate in Pet Sitting/Boarding. Our families and their children often visit our cottage, so the dogs are used to children big and small. 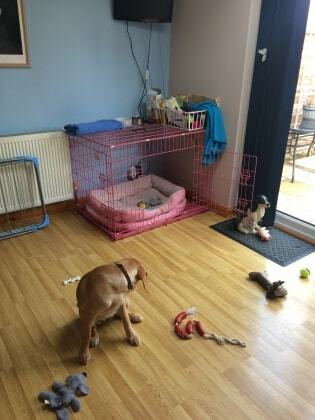 Our home has a small, secure garden area where the dogs can easily relieve themselves and play. We are ideally situated close to dog friendly parks, open fields and The Climpings beach is a short drive away. Westergate is within a 10 minute drive from the beautiful South Downs National Park where the dogs can enjoy the wonderful walks. When not walking dogs I enjoy yoga, swimming, Pilates and reading. Our springers were very happy staying with Ann. She is a lovely kind lady and it was really 'home from home' for our pets. It was great to have regular photos and even a video clip to see our dogs having fun on a run and also curled up contentedly asleep. Thank you so much Ann. Hope they can come and stay with you again sometime. Hugo had the pleasure of spending the day with Ann and her lovely dog Franki. I had pupdates throughout the day and he appeared on Franki’s Instagram page which of course gave me a smile during my daily lunch break browse. He is now sound asleep after 2 walks, special treats and lots of fun. I am sure Hugo is looking forward to his next visit already!